Photo courtesy of Duke Athletics. Setbacks can be a very cruel thing. They happen at a time when it is needed the least. They happen at a time when everything is going great for someone. Then once it happens, it’s like that person’s world comes tumbling down. How a person comes back from something so trying is up to them. Rather than give up, Harry Giles III fought to work his way back from injury. The 6-foot-11 forward from Winston-Salem, North Carolina, has experienced plenty of highs, such as being rated the No. 1 player in the country in the Class of 2016 by ESPN during the summer of his senior year in high school to lows such as suffering an ACL injury twice, which caused him to miss both his sophomore year and all but one game of his senior year in high school. Giles started out high school at Wesleyan Christian School, where as a freshman he was named National Freshman of the Year by Max Preps and led the Trojans to NCSIAA AAA state title while averaging 12.5 points and 9.5 rebounds. Then as a sophomore, he went down with the first of two ACL injuries, in which he missed the entire season. As a junior, he rebounded from that injury by putting on a strong performance in his first game back with 38 points and 19 rebounds for the Trojans. That one performance was one of many in a big season for Giles, in which averaged 23.9 points and 12.5 rebounds to lead Wesleyan Christian to a 30-5 record and another appearance in the NCSIAA AAA state title game. He would win the Max Preps Junior All-American Award and the All-USA North Carolina Player of the Year Award. Harry Giles handles the ball while at Wesleyan Christian Academy. (Photo courtesy of Wesleyan Christian Academy). In that time, Giles would also win three gold medals for USA Basketball and also play on the Nike EYBL circuit for the CP3 All-Stars, leading them to a deep run in the 2015 Nike Peach Jam, one of the most prestigious events of the AAU season. In the semifinals, CP3 would meet up against the St. Louis Eagles, in which Giles would match up against his future Duke teammate Jayson Tatum, who was also a top-five recruit in the same class. In the game, Giles scored 12 points, and added 14 rebounds and four assists, but it wasn’t enough as CP3 would go down against the Eagles, 74-73. Giles would then make a big move for his senior year as he transferred to Oak Hill Academy, a school in Mouth of Wilson, Virginia with a top-flight program that has produced the likes of current NBA All-Stars Rajon Rondo, Carmelo Anthony and Josh Smith to name a few. But on November 3rd, 2015, he would suffer another setback, as another ACL injury would befall him once again during one of the team’s first games of the season. He would miss the rest of the season and the opportunities to play in events such as the McDonald’s All-American Game, the Jordan Brand Classic and the Nike Hoop Summit. On November 6th, 2015, just three days after tearing his ACL, he would make a commitment to play for Duke, which made him a part of what was considered the No. 1 recruiting class in the country by 24/7 Sports with McDonald’s All-Americans such as Tatum, Frank Jackson and Marques Bolden and other highly-recruited players such as Jack White and Javin DeLaurier. Due to the injury, Giles sat out during the first part of the season after having surgery on his knee on October 3rd. He would make his debut on December 19th, in a non-conference game against Tennessee State, in which he played only four minutes. As the season progressed, things started to get better, as he played his finest game against Georgia Tech on January 4th, as he scored 10 points and added 12 rebounds in a 110-57 win for the Blue Devils. 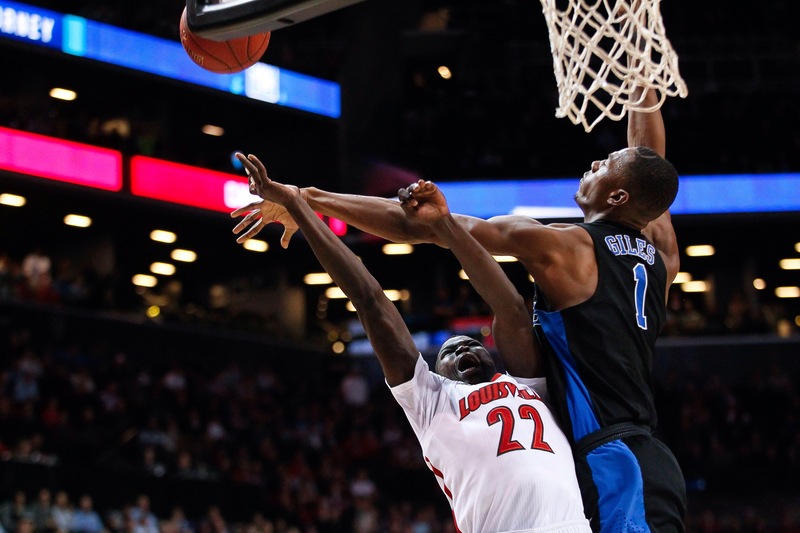 Giles would finish the season averaging 3.9 points and 3.8 rebounds for Duke, who would go 28-9 on the season. However, he was one of the catalysts in the Blue Devils winning the ACC championship, and in making a second-round appearance in the NCAA Tournament, where they would be upset by South Carolina in the second round. Although the season didn’t go as planned, Giles proved that he could play on the college level and is destined for bigger and better things. On March 28th, Giles would declare for the NBA Draft, forgoing the final three years of his collegiate eligibility. So far, the kid that was once thought of to be a top-five draft pick has been projected to be picked at No. 24 in the upcoming draft by Draft Express on June 22nd. Courtesy of Home Team Hoops. Courtesy of The Patient Chase. Courtesy of ACC Digital Network.